My second stop for this project is actually the stadium closest to me, and home of the MLS team I support: the Columbus Crew. Just over an hour’s drive up I-71 from my Northern Cincinnati abode, I’ve been regularly attending Crew games since the inaugural MLS season in 1996 when they were playing in the cavernous Ohio Stadium. And though many feel it’s started to feel a bit antiquated, the primarily cinder block and aluminum Mapfre Stadium — the league’s very first Soccer Specific Stadium — remains a welcome improvement over the previous digs. In fact, of all the various stadiums I’ve watched soccer over the years on both sides of the pond, the best fan experience I’ve ever had was still at the meager home of the Crew during last year’s US World Cup qualifier against Jamaica (which I wrote about here). So while 14 years of heading to the renamed Mapfre Stadium might have me feeling like I already know the place like the back side of my hand, I still wanted to make sure I got input from the folks who show up week in and week out. 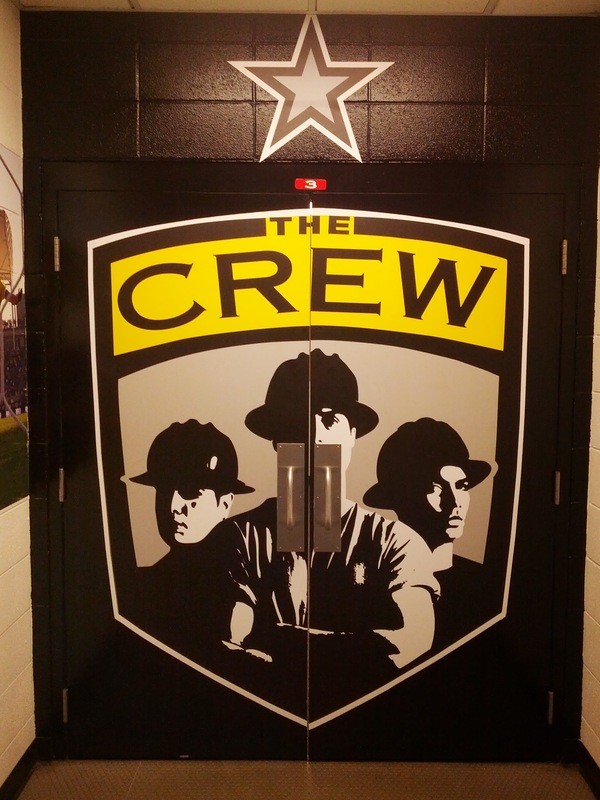 So many thanks to my hosts — Crew Communications Manager Tim Miller, Stadium General Manager Ryan Smith and the Crew Supporters Union — for showing me around on my latest trip to Columbus as the Crew shocked Eastern Conference pace-setters Impact Montreal with a surprise win. Centrally located within the state, just about every Ohio-based visitor can drive to Columbus in about two and half hours. Out of state fans will also find it easy to get to town, as Columbus sits at the intersection of I-70 and I-71, two major interstates. If you’re coming from afar, Columbus is serviced by Port Columbus International (CMH), just a 20 minute drive from the stadium. If you’re averse to flying, train and bus options are also available. Staying overnight in Columbus while in for the game? Finding accommodations of all types should relatively easy, provided there isn’t an Ohio State football game the same day. While there are options close to the stadium, they’re dumpy and not really near anything. I highly suggest staying in the Short North/Arena District area just North of downtown Columbus and a 10 minute cab ride away from the stadium. There you’ll find far nicer rooms and a litany of bars, restaurants and other attractions within walking distance. Also check out the Sheraton on Capital Square, which is the club’s official hotel partner. 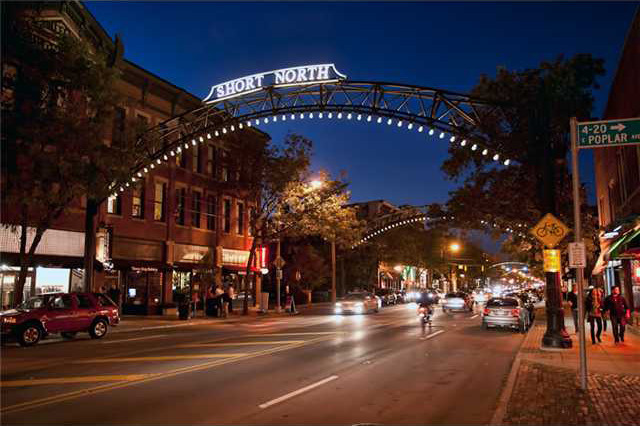 columbus’ short north area is one of the most vibrant areas of the city, and a great place to find some eats and drinks. Located literally right next to I-71, getting to Mapfre Stadium from just about anywhere in Columbus is relatively a breeze. However, parking bottlenecks do tend to make getting into the lots a slow-go the closer you get to kickoff. From the North (Cleveland): Take I-71 South towards downtown Columbus, past the north outer-belt way. Exit I-71 South at the 17th Ave exit (just after the Hudson St. exit, and before the 11th Ave exit). Turn right at the end of the ramp onto 17th Ave, and follow signs/traffic personnel. From the East (Pittsburgh/West Virginia): Take I-70 West towards downtown Columbus, past the outer-belt way. Stay in the right lanes and look for signs for I-71 North. Take the I-71 North exit at downtown Columbus, and stay on I-71 North until you get to the 17th Ave exit (just after the 11th Ave exit, and before the Hudson St exit) Turn left at the end of the ramp onto 17th Ave, and follow signs/traffic personnel. From the Port Columbus Airport: Take I-670/US-62 West 2.6 miles to I-71 North. Stay on 71 North until the 17th Ave exit (just after the 11th Ave exit, and before the Hudson St exit). Turn left at the end of the ramp onto 17th Ave, and follow signs/traffic personnel. From the South (Cincinnati): Take I-71 North towards downtown Columbus, past the outer-belt way. Stay in the right lane and look for signs for I-71 North, eventually merging in with I-70 East for approximately 2 miles, and then split back with I-71 North towards Cleveland. Stay on I-71 North until you get to the 17th Ave exit (just after the 11th Ave exit, and before the Hudson St exit).Turn left at the end of the ramp onto 17th Ave, and follow signs/traffic personnel. Pro tip: While you can also exit at the Hudson Street exit, due to the traffic pattern, it can get really backed up. Concerned about where you should park, or where to get the best tailgate experience? We’ll get to that shortly… but you impatient lot can jump ahead here. Columbus might be the capital of Ohio and the third largest city in the Midwest, but it’s woefully under served on the public transportation front. In fact, Columbus is the largest metro area in the country without a better public transport service than buses. For example, taking the bus from Port Columbus Airport to Mapfre Stadium takes a whopping hour and 45 minutes instead of the 20 it takes by car! That said, a few stops for the COTA bus lines are within walking distance of the stadium, the closest of which being at the Lowe’s just north of the stadium at Hudson and Silver Drive. If you’re dead set on using the busses, I suggest using Google Trip Advisor to get yourself accurate directions. As for bus-in programs, Crew Supporters Union president John Clem said the club is “pursuing funds to get a shuttle running from several nearby supporters bars”. Though not up and running yet, this would be a huge help for fans given the lack of other transportation options on the table. Tailgating is definitely a portion of your average Crew game day experience, and you’ll find loads of fan tailgates all across the lots. You can find the Crew Supporters Union, and often other independent supporters groups too, tailgating Southwest of the stadium’s VIP lot, at the intersection of Black & Gold Boulevard and Korbell Avenue once your inside the gates (see the parking map here). The supporters groups have also made it a habit of banding together for #CrewMegaTailgate where all of the SG’s join for one massive tailgate. Long story short, lots of beer, food and good discussion… thanks for the hospitality guys! For away days, the Crew have also organized the “Crew Pub Tour” for fans to gather at specific local pubs to cheer on the Black and Gold together. Tickets for Crew games (available through the club website) are generally pretty affordable, and are comparable to — if not cheaper than — most of the other sports events around town. Single game tickets run anywhere from $23 along the South endline to $50 in the Center Circle Club seats at West midfield. Personally, I’m a huge fan of buying the cheapest tickets possible and then standing at the corner terraces on the concourse level in front of the concessions — it offers a great vantage point and makes for easier access to beer! See the stadium seating chart for more info. Will Call, along with walk up ticket sales are located at Gate 5 at the Southwest corner of the stadium. Sites like StubHub often offer limited tickets for below face value, but availability varies game by game. You can also get cheaper tickets by procuring tickets through your favorite Supporters Group. Within 10 minutes of entering the stadium, it’s nearly impossible to not automatically know where the Crew Supporters Union, the Hudson Street Hooligans, La Turbina Amarilla and the Buckeye Brigade call home. 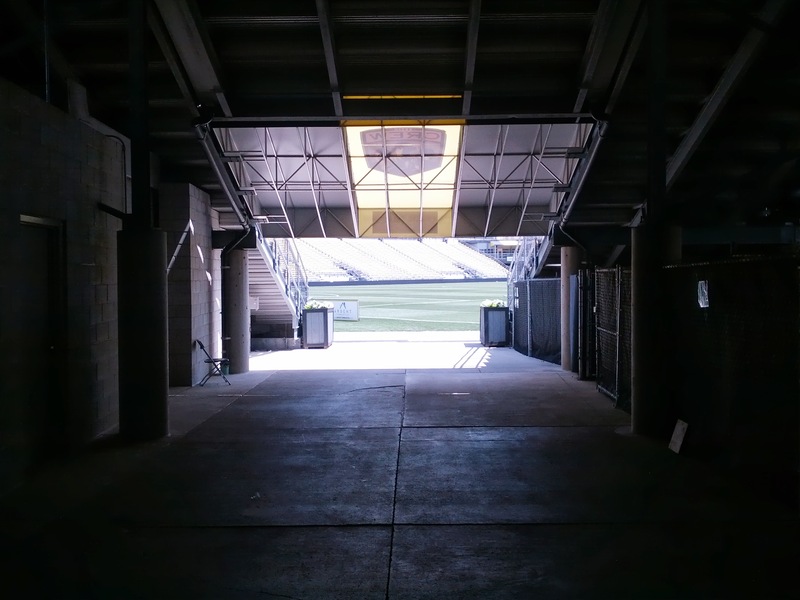 To the looker’s right of the stage in the Northeast corner of the stadium — Sections 139, 140, 141, 142 and 101 — is what has come to be known as the Nordecke. Smoke bombs, flag waving, and drum pounding are not infrequent within these confines. The groups have seen tremendous growth over the last few seasons, and have really upped the ante when it comes to supporting in Ohio. If you’re down to jump, scream, sing and cheer on the Crew, tickets for these sections are best purchased directly through the SG’s… and a bit cheaper, too. Traveling fans of other clubs don’t have an “official” area they’re to sit, but most times they’ll end up being placed in the South stands in Sections 115 through 117. The Nordecke sits prominently in the center of this shot, in the Northwest corner of the stadium. The Crew Kicker Plaza packed with pre-match activity. The Stadium Club offers a great place to enjoy a beer in the shade prior to the match. 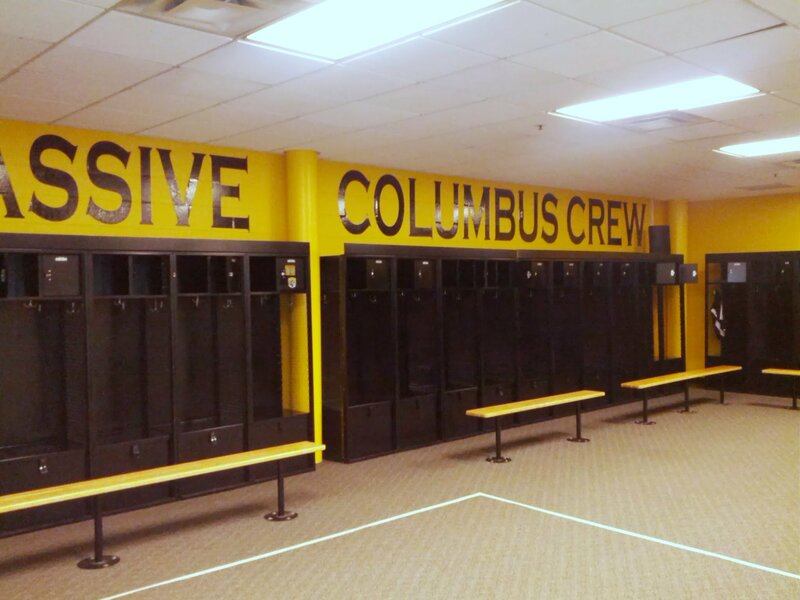 Inside one of the comfy executive suites at Crew Stadium. Scotts Field Level Seats which are perched right next to the Crew Bench and include an all-inclusive buffet and in-seat drink service. The VIP Terrace, located in the Southwest corner of the stadium below the concourse level, is great for larger groups of at least 50 guests and provides all-inclusive food and drinks. Underneath the awning at the South touchline are field level seats that can accommodate groups large and small. Great for groups with kids, they don’t exactly offer the best view of the pitch. There are four main concession stands around the stadium concourse, with the usual American sporting event staples (hotdogs, popcorn, pizza, nachos, etc.) available. If you’re willing to hike about the stadium for something different, you can also munch on Columbus-native White Castle and Jeni’s Ice Cream (both available on Crew Kicker Plaza on the South side of the stadium), as well national chains Subway subs and Papa John’s Pizza (located ground-level at the Southwest and Southeast corners respectively). I can also highly recommend the “Frankie-furter” chili dog, named for Crew and USMNT legend Frankie Hejduk. New for the 2015 season, the main plaza on the Southern side of the stadium also has a litany of local food trucks. My favorite? Hot Chicken Takeover. Since Columbus is a Budweiser — erm, InBev — town, they’re a corporate sponsor of the Crew and their beers dominate the selection. In addition to your Buds, Bud Lights and Michelobes, they also offer some of their “macro-crafts” like Goose Island all over the stadium. League sponsor Heineken also has a healthy presence. However, there are several dedicated craft beer stands that feature local breweries such as Land-Grant Brewing, Four Strings, Elevator and Columbus Brewing. Also, be one the look out for one of three annual “Dollar Beer Nights”! A selection of up to 10 handles can also be found at another “secret” spot, which I’ll get to a little later. In addition to promotional events scattered throughout the season, there are lots of additional activities for fans and families to take in during match days if you’re not looking to tailgate. The Crew Kicker Plaza, located just inside the South gates of the stadium, normally features blow up games for the kids and a band on stage for pre- and post-match entertainment. On the West side of the stadium you’ll also find the Stadium Club, a large tent with TV’s and some decent beers on draft. Post-match concerts and international friendlies are other frequent draws, especially during the warmer summer months. These doors make no doubt of whether this is the home or away locker room. Looking down the tunnel towards the pitch. 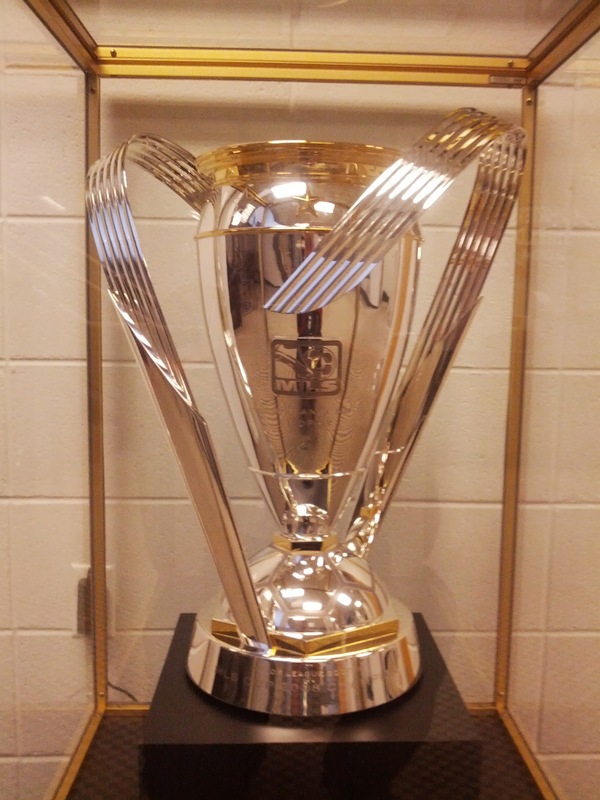 I tried to convince them to let me lift the Crew’s MLS Cup, but they politely declined. 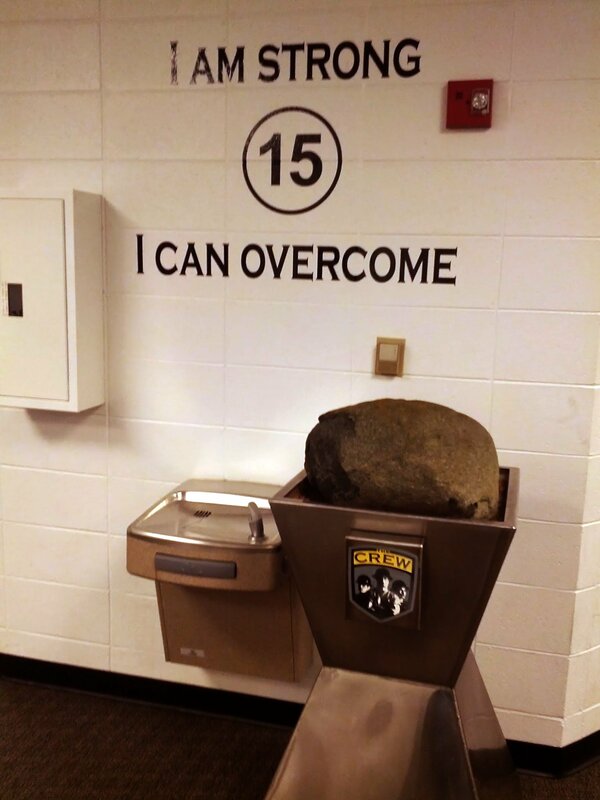 Legend has it that Lamar Hunt himself found this rock that sits in the locker room by a small memorial to Kirk Urso. Since Mapfre Stadium was the country’s first purpose-built soccer specific stadium — built on a budget of just $39.3 million (inflation adjusted) — and because the team holds their daily trainings off site, the player facilities are a very no frills affair. Cinderblock walls encompass a spacious, yet basic locker room and simplistic training room. While some players may scoff at the lack of more modern comforts, it gives the room a very “let’s get down to business” feel that you might find beneficial on match days. And since the Crew’s training facilities are off site and the players only get to use this locker room on match days, you can also imagine the pride a player might feel for getting to have a seat in the Spartan surroundings. While the stadium may at times seems a little primitive, the pitch is far from it. The 115 x 75 yard pitch is well-known within the league for its consistency, enough so that US Soccer has repetitively trusted it for some of their biggest matches. Interestingly, my visit happened to be while the grounds crew was prepping for the next day’s game against Montreal. I’d never seen a professional pitch being set up before, and it was cool to see the elaborate system of ropes that they used to line the pitch. click on the picture above to see a 360-degree interactive view from the mapfre stadium pitch! Like most MLS clubs, the Crew are big fans of having the team interact with the public. So snagging an autograph or snapping a picture with your favorite player is definitely possible… though you may need to work for it. If you have seats that allow you to get down near the field during pre-match warm ups, players have been known to sign autographs and pose for quick pictures. Also, the players will be out and about in the community for various promotions, so keep an eye on the club’s social media feeds for updates. In every stadium that I visit, I try to uncover one “hidden” aspect of the stadium that most fans don’t know is there. And as somewhat of a local, I’m a little reluctant to give up this secret! But the hidden gem of Mapfre Stadium has to be the “Upper 90 Club” — rebranded this year as the Heineken Star Lounge. Located below the concourse in the Southeast corner of the stadium, the Upper 90 Club is a climate controlled bar with around 10 handles of craft beer, a full bar, HD tv’s to watch the game, private restrooms and a covered terrace that over looks the pitch. Without a doubt, this is the best place in the stadium for beer lovers, and it can also be a life saver during rainy or cold weather. Just be prepared for incredibly lengthy lines. Thanks for reading my review of Columbus’ Mapfre Stadium! Have a suggestion or see an inaccuracy? Be sure to reach out to me at wrongsideofthepond@gmail.com.